Wealth inequality, when comparing whites with different racial and ethnic groups, has widened since the Great Recession, or during Barack Obama’s presidency, a Pew Research Center study reported on Friday. The Great Recession, which was fueled by the crises in the financial and housing markets, undermined the net worth of all American families. However, even as the current economic rebound starts repairing asset prices, US households are not all benefiting at the same rates. 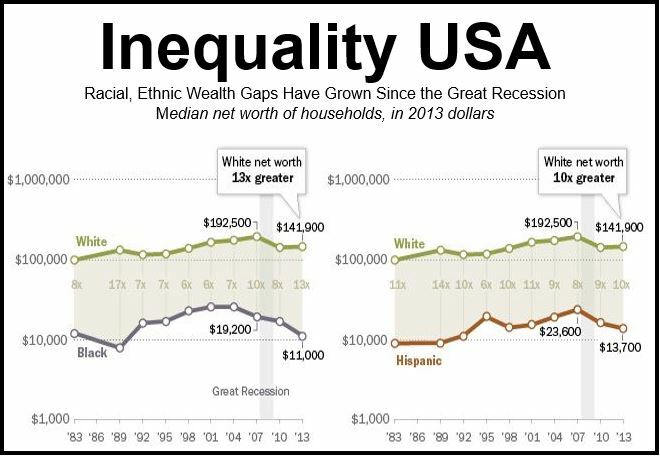 In fact, according to the authors, since the end of the recession wealth inequality along ethnic and racial lines has widened. In 2010, the median wealth of white households was eight times greater than that of black households, compared to 13 times in 2013, the authors revealed after examining data from the Federal Reserves Survey of Consumer Finances. A widening wealth gap can be seen when comparing white and Hispanic households too. In 2010, white households’ wealth was nine times greater than that of Hispanics, compared to 10 times today. Wealth inequality between blacks and whites in the United States today is greater than at any time since 1989, when white household wealth was 17 times higher than blacks’. Today’s white-to-Hispanic wealth ratio is at its highest point since 2001. (The study did not analyze the wealth of Asians and other racial groups). The overall net worth of all Americans – the difference between what they own and what they owe – held steady during the economic rebound. In 2013, the average household had a net worth of $81,400, which was virtually the same as the $82,300 recorded in 2010 (all values expressed in 2013 dollars). Household wealth stability follows a significant decline during the Great Recession. The median net worth of American households plunged by 39.4% from 2007 to 2010, from $135,700 to $82,300. This was due to falling house and share prices. However, during the economic recovery the authors detected a clear divide in the experiences of white, Hispanic and black households. The non-Hispanic white households saw their median wealth grow by 2.4% from $138,600 to $141,900 from 2010 to 2013. Over the same period, median wealth for black households declined by 33.7% from $16,600 to $11,000, and for Hispanics it dropped by 14.3% from $16,000 to $13,700. 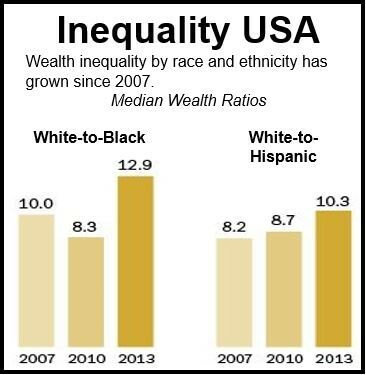 For all households – Hispanic, white and black – median wealth is still below its pre-recession level. The authors say that widening inequality during the economic recovery has occurred for a number of reasons. Wages: according to the Federal Reserve notes, medium income for blacks, Hispanics and other non-whites combined (minority households) dropped by 9% from 2010 to 2013, compared to a 1% decline for non-Hispanic white households. Consequently, minority households may not have upped their savings to the same extent as white households have. In fact, they may have used up more of their savings during the recovery. Financial Assets: since the end of the recession, stocks and other financial assets have recovered more rapidly than housing. More white households tend to own stocks directly or indirectly through retirement accounts, compared to minority households, and were consequently in a better position to gain from the recovery in financial markets. Financial assets are intangible assets such as bank deposits, bonds, and shares. Ownership of Key Assets: overall, since the recovery started, American households have reduced their ownership of key assets, such as business equity, stocks and homes. However, this decrease has been greater among minority households. The percentage of non-Hispanic whites owning a home dropped from 75.3% to 73.9% from 2010 to 2013, i.e. a decline of 2%. For minority households over the same period, there was a fall of 6.5% from 50.6% to 47.4%. Most studies have found that inequality in the US, UK, Germany, Canada and the other advanced economies has been getting larger over the past twenty to thirty years. This Market Business News video explains, in simple terms, what income inequality is.